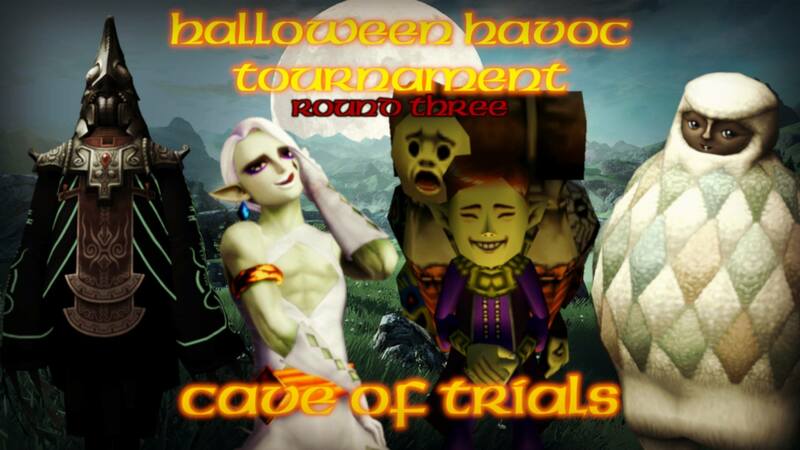 Cave of Trials: Round Three of the Halloween Havoc Tournament Becomes a Fight for Survival! + Best Zelda Ever Special Announcement! Ladies and gentleman, my name is Kristen. Rosario. And I am your host for the CAVE OF TRIALS! We are now entering the semifinals as round three of the Halloween Havoc Tournament is underway! Our 16 competitors have been sliced and diced to just four as we are inching closer and closer to the first champion of my NEW ERA! With all of that out of the way, let us take a current look at the tournament standing after the second round! The winners continue to dominate their opponents in every way imaginable! With the semifinals beginning, it looks to be a bloodbath for survival folks! The first fight in the third round is Yeta vs. Happy Mask Salesman! Both of these competitors have dominated each of their respective bouts, so this will be no easy task for either fighter. It is the corrupted lover taking on the shaker of Link’s! Who leaves still standing? Up next on the other side of the tournament bracket is Ghirahim vs. Zant! These fighters both have proven their metal in the ring, and look to enter the finals of the Halloween Havoc Tournament! Sporting unique flares in battle, Ghirahim and Zant both bring their own levels of madness. Who wants that championship more? As you may have figured, the finals of this tournament will be next week. Plus on November 2nd, Zelda Dungeon’s worthless peons (excluding myself of course), will be unveiling their official “Best Zelda Ever” list for 2018. With that being said, our NEW ERA champion will need someone to face going into November. Here’s what will happen. I will choose three competitors from the top three Zelda games from that list and they will face off in a Triple Threat Match starting November 4th to determine the number one contender for the Cave of Trials NEW ERA Championship! That’s it for this week! Who will win? Who will prevail? Who will become the new era’s Cave of Trials Champion? Who will get the opportunity to face off in the Triple Threat Match? Tune in next week as we move forward into the finals!